Pain. When you are dripping sweat, your heart is pounding and your legs are burning, what else can you put into your training. Case and point my friend here after his FTP test in one of the branches of the state of the art cycling ‘studio’ – Athlete Lab. I should say that guy has suffered all his way up to a very respectable 4.22w/kg in the last few weeks under the tough-love of our coaches. A cyclist’s ability to suffer is often the deciding factor on who steps up onto the podium at the end of the day. To be competitive, you can be guaranteed that your ability to tolerate misery and dig deeper than you ever thought possible, will be a deciding factor. So with all these cycling articles taking care of racing elements such as nutrition, fitness, training, hydration, I thought at least today you would be better served by a bit of inspiration. 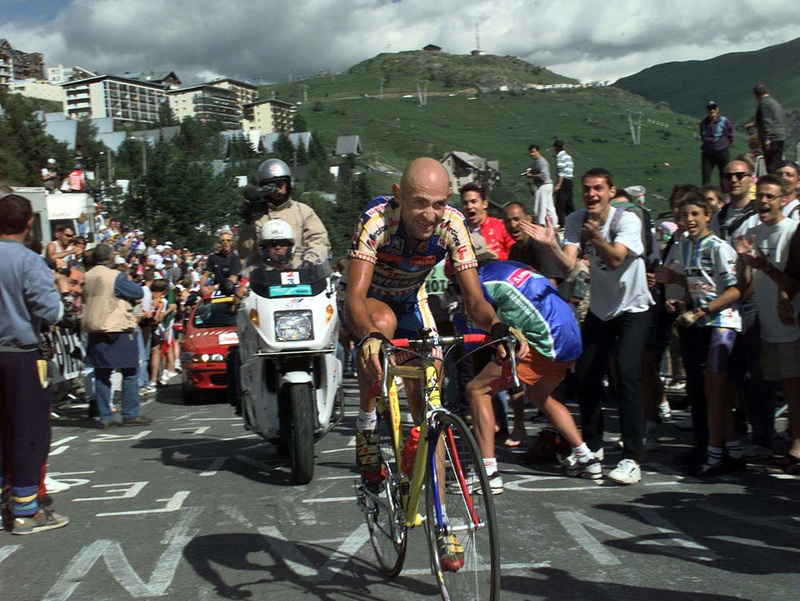 A short story I suppose, of one of the great kings of suffering – Marco Pantani. With the development of aerodynamic time-trial bikes, teardrop helmets, low-friction bodysuits and wind-tunnel testing in the early 1990s, it seemed stage-race procycling would inevitably become the exclusive domain of physical freaks such as Miguel Indurian and Jan Ullrich. These riders with their powerful physiques could dominate the flat stages with monstrous sustained speed, with tactical conservatism winning huge time gains in the TT stages – I remember reading that groups of the peloton would have to gang up on Indurian or ‘Big Mig’ just to make him sweat such was the smooth, robotic nature of his victories. Marco Pantani must then have come as an explosive shock to the order of this peloton. The only method for the rider to achieve overall victory against these giants was to push himself to the limit in the high mountain stages, eating up the 3, 5, 10 minutes that had been accumulated by his rivals in the long flat legs. Pantani was not content on just achieving stage wins and would dart out in front, disappearing into the calm, serene peaks of the French Apline, only knowing that he would have to once again face the very outer limits of his physical capabilities. 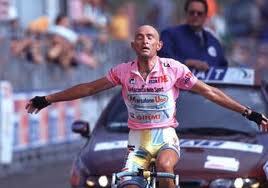 Marco Pantani is widely considered one of the best climbers of his era, perhaps of all time. At 1.72 m and 57 kg, he had the classic build for a mountain climber and we can see this legacy continue in riders such as Quintana today. His training was designed to face the impossible and specialized in mountain top finished by training 8 hours, with the final fifty kilometres being brutal, soaring climbs. In 1998 Pantani achieved what was thought unattainable – even impossible for an athlete of his frame – in the world of modern cycling, by winning both the Tour de France and the Giro d’Italia. Indeed he is the last cyclist to have done so and it is must be noted that this is something that even the dominating Lance Armstrong didn’t ever set as a goal. For the cycling superpower of Italy, he is also only the sixth Italian rider after Ottavio Bottecchia, Gino Bartali, Fausto Coppi, Felice Gimondi and Gastone Nencini to win the Tour de France. As you can imagine, his attacking style and aggressive, ‘never say die’ riding made him a huge fan favourite and he became known as ‘Il Pirata’ because of his shaved head, bandana and earrings. 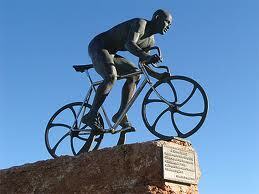 However as is the curse of much of cycling in the 1990s, his career was beset by doping allegations. Although he never tested positive during his career, in the 1999 Giro d’Italia, he was expelled due to his irregular blood values – who knows if he was clean or not. Although he was disqualified for “health reasons”, it was implied that Pantani’s high haematocrit was the product of EPO use. 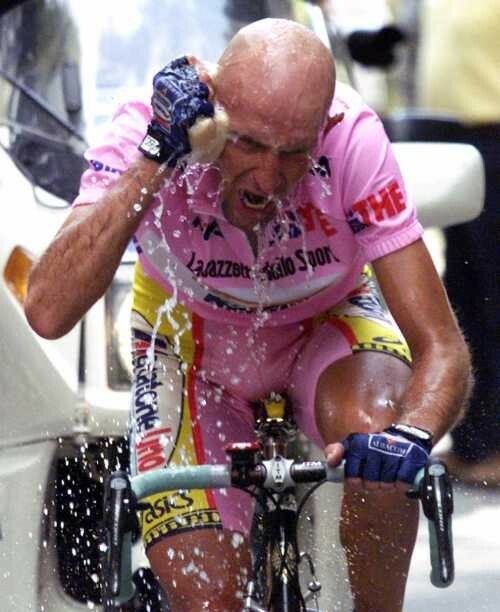 Following later accusations, Pantani went into a depression from which he never fully recovered. He died of acute cocaine poisoning in a hotel room in 2004. So with this tale and in the world’s of Jens Voigt (cycling’s beloved hardman and ‘beautiful sufferer’), next time your legs are telling you to stop, grit your teeth and say ‘Shut up legs’.